You’re a sophomore (maybe a junior by credits, don’t get cocky). You’re about to study abroad. You notice a lot of the coolest places (*cough* Spain *cough*) require or highly suggest a homestay. You wish you had someone to give you advice about the dirty details of the homestay life. You stumble across this blog. Or, scenario B: you’re a future employer stalking me on Google. You stumble across this blog. So, either way, here you are, reading my advice about homestays. Homestays are tricky to write about because everyone has such a unique experience. So, I would like to disclaim that my observations and experiences may not hold true for every place, family, program, etc. To begin, I would like to touch on the type of people who sign up to host a student. The first type of homestay is a family that wants to provide a room to a student in order to supplement their income. As Spain is having tough economic times, this is a very common scenario. The next type of homestay is someone elderly and/or alone, usually a woman, who would like some company. This situation can be weird because you almost feel obligated to spend time with your host family. The last type of homestay includes a family with kids. In this type of homestay, the family sometimes would like you to practice English with their kids. The three scenarios for homestays are just generalizations, naturally. Sometimes, the host family can be a combination of the different types described above. For example, my host mom Maria* is a combination of the first and second situation. However, sometimes homestays can be nothing like what I described. For example, my friend’s family requested to be a homestay because their cousin hosts students as well. After realizing the different types of families, the best advice I could give is to fill out the homestay request form as detailed as possible. A lot of other applicants do not take the time to do this. Therefore, if you are more specific you will likely get things you request. For example, I wrote down a specific neighborhood on the form. You could request a specific walking distance from school. Some of the surfers on my program asked to be closer to the beach (however, this did pose a longer commute to school and metros don’t run super late every night of the weekend!). A lot of people request families with kids. 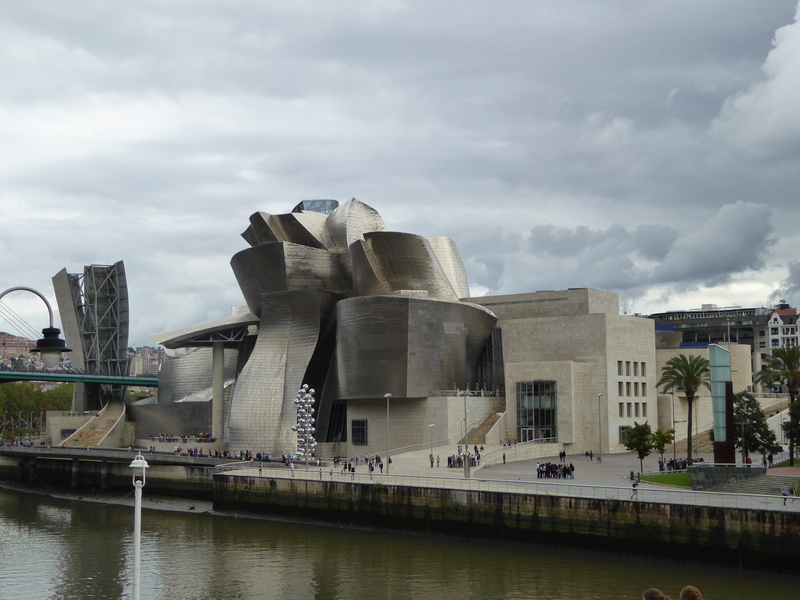 I requested to be near the Guggenheim Museum, a central location in Bilbao, Spain. Another important part of the homestay request form is the roommate section. I said I did not care if I had roommate and I was assigned a single. At first I was excited to have a single, because roommates sound like the epitome of freshman year. I soon realized there were pros and cons to living in a homestay alone. For example, it might have been easier to have a friend to work through the language barrier with. It also could have been nice to have a friend to go out with, because it is always safer to walk home with someone. However, living alone helped me be independent from the group and I also got to practice more Spanish! You should consider these things before filling out the form because it really shapes the homestay experience. Finally, once you are abroad and living in a homestay, remember that it is going to be weird. Maria treats me like a child a lot, as if I have not been living on my own for a while now. For example, after my return from Morocco, my host mom had reorganized my whole closet. All of my sandals are now missing. The same thing happened to my swimsuit top in September. If my bed isn’t made perfectly, she will remake it. She does my laundry, cleans my dishes, and has even blow dried my hair. And I kind of feel helpless because I never had the courage to tell her these things bothered me and that I am a capable adult. I also was not really sure how to say all of these things in Spanish. If I had been honest with Maria, I would have saved a lot of time harboring anger toward her. However, if you are only going to be honest with your host family about one thing, let it be the food. Otherwise, they will cook you the same crappy dish they think you like (think: pigs’ feet). In the end, I had a lot of trouble getting along with my host mom. But do I regret it? Not really. If I had lived with friends, I would not have practiced Spanish every day. I would have wasted time cooking and cleaning that I could have used exploring. In the end, it is one thing to live alongside a while culture abroad, but my homestay let me live within the Spanish culture.